An under-rated competency–which should be considered MUCH more important–to software and hardware companies is customer service. I suppose that’s only natural; tech companies are very focused on gaining strategic advantage via technological advances and product differentiation. Once the product is in good shape, companies shift their focus from development and become hell bent on marketing and sales activities to attract new customers. But what about taking care of existing customers? And how about the operational details of what happens when someone—be it a prospect, new customer or existing customer—contacts the company for assistance? I find these are areas that tech companies aren’t “naturally good at”. It’s not part of the basic DNA of most software and hardware companies. Very seldom will you see a founder or CEO who came up on the support or customer service side of the tech business. Because of this, customer support is often an afterthought; a detail that senior management never seems to have time to get to—as they struggle with the issues that are viewed as strategic: product development, marketing and sales. This doesn’t seem to fit in the category of “customer service” and technically it doesn’t. But bad user interfaces and poor user documentation are a primary reason that your software or hardware customer service organization becomes overwhelmed. So above all, put extra work into getting your interface right. Your company will benefit greatly through less “negative call” volume and which can put great strain on customer support. Customer service and support is viewed almost universally as a cost center in the tech world, if not in the business world 0verall. I will admit that I initially viewed it that way when I started managing a P&L. With this viewpoint it becomes very easy to put support activities first in line when you need to cut money out of next year’s budget. Beware of doing this. Excellent customer support leaves a lasting impression with clients—and bad customer support leaves an even BIGGER and more lasting impression. Some examples I’ll provide (not purely tech–but tech-driven) are from personal experience. I have had money with Fidelity Investments for many years and this long term relationship is due in large part to their consistently excellent service and support. I also have an account with ETrade, whom I was intrigued with due to their innovative technology and business practices. But if you actually need to speak with a real person at ETrade—oh boy, could it be painful. So the bulk of my money remained with Fidelity. Dell Computer is another company that in my opinion jeopardized their historically dominant position via reduced support quality. They no longer support the software that comes on their computers—just the hardware. And even a basic hardware warranty costs extra after a year. This is true of of most of the PC hardware suppliers due to thin margins but it’s short-sighted, imo. I understand the concepts of unbundling and customer choice, but I find this extreme. Unfortunately personal computers aren’t just metal boxes of electronics; they are complex hardware/software systems. Supporting software really isn’t optional, if you want a good user experience. Like many of their competitors Dell also took their Call Centers overseas to save money. While was still possible to get an excellent support rep on the line from their faraway call center, it became quite spotty and you more frequently got someone that couldn’t help at all – and also might not be able to understand sue to their thick accent over an inexpensive VoIP connection. Dell appears to have at least partially brought support back to local markets, but much damage was already done to their brand that will take a long time to undo. I’m sure some operations VP received big annual bonuses for reducing support costs through these and other steps for Dell. The cost savings no doubt looked huge. But what is the true cost in reduced sales and fleeing of long-time customers (like me!)? This reduction is sales is not as obvious as the direct cost savings, but no less real—and probably more important to the business in the long run. This is my pet peeve and the pet peeve of many millions of other folks as well. I’m a tech guy, and love the application of leading edge technologies to reduce labor costs. But enough, already! A number of otherwise good companies have taken automated voice mail attendants WAY too far. They make you feel like a mouse in a ten square mile maze. Companies need to remember that when you pick up the phone to call, it’s with the intention to TALK TO SOMEBODY. Using technology to quickly route people to the correct department, or answer simple inquires like directions to the company is an efficient use of technology for both the company and customer. But making it extremely hard to get through to ANYONE, even after wading through seemingly endless nested menus, is just ridiculous. The only purpose it serves is to alienate your customers and prospects. This is truly the definition of “penny wise, pound foolish”. After waiting in voice mail hell, you think it can’t get any worse. But wait. After the half-hour (or worse) wait your call is now answered by someone so green, so incompetent or so rude that your frustration might turn to rage. You are asked to enter your account number on the phone pad. Then the rep answers, and again requests the exact same information. You haven’t reached the right department, of course, so you are transferred to another department, where the rep asks you, yet again, for the exact same information. After this rep finally fills in his or her form with the required repetitive information (not answering ANY of your questions questions until it’s complete), you finally get to explain your unique problem,which cries out for an exception to normal company policy. But the support rep robotically and coldly repeats the company policy—which you already knew. Think someone will want to do business with this company again? Customer and technical support is CRITICAL in the long run. It’s one of the true long term differentiators in any market. Spend a little more to hire and retain good people, train them well and empower them to actually take care of real world customer issues. 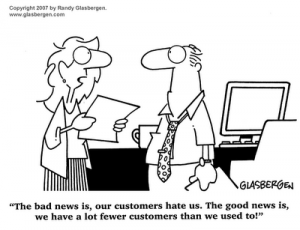 Retaining customer good will is such an obvious thing to strive for, but remarkably, it is given short shrift all too frequently. If you make sure to do the right things to support your customers then your company you will stand out from the pack, and it will pay back many times in the future. I’m on the West Coast of the US, so this happens all the time. Try to call customer support in the early afternoon, but the office closes at 5P Eastern Standard Time. This is a particularly important issue for those of you serving consumer markets—many people can’t easily call support lines from work without putting their employment in jeopardy. In this day of inexpensive, fast communications technology and worldwide commerce, there is no excuse for inconvenient business hours for the markets that you serve, since you can put support personnel in any virtually time zone that you serve. This is something that has continually degraded for customers over time, which I alluded to earlier in this article. It used to be that technology companies supported their products for free. The economics of competition has in the long run made this go the way of the dinosaurs. Frequently this is with good reason. A well-priced maintenance contract from a B2B software company which provides an 800 number, unlimited supported, and all major and minor updates can be a really good value. If it is priced near the industry standard 18-20% of product cost and enables the vendor to provide excellent support—that’s great. But what if the support is lousy and it’s priced at 30% of the cost of the product annually (whether a separate traditional maintenance contract or bundled into SaaS subscriptions)? Or how about a consumer software company that is charging $100/hour for support, without even the benefit of a free 30 day startup window to troubleshoot their buggy and non-intuitive product? Give me a break! Again, if you want to stand out in today’s market, try providing an intuitive, bug free product, coupled with free or reasonable support (there won’t be many support calls needed if you do this!). People will beat a path toward your door—and tell every friend they have. This won’t show up in the Controller’s cost control report—but the benefits to your company’s top line will be enormous. So these are some of the low tech ways to screw up a high tech business. Software and Hardware CEOs, keep your eye on the customer service ball. Otherwise, a savvy and opportunistic competitor with lesser product technology may take advantage and steal a piece of your market share. Please add to this discussion—post your own views on how to provide (or not provide!) great customer service in the comments section below. Technical support was part of the sale at our company. We didn’t make the product easier to use, because making the technical support call tightened the relationship between the customer and the company. When considering the intial sale, customers evaluate technical support, customer support, documentation, training, billing, and shipping. All of these elements contribute to the brand, the user experience, the customer experience, and whether they will buy the upgrade. Since more money is made on upgrades, these elements become part of the enactment chains that bring the user/customer back to the sales funnel. I agree with this post mainly because I’ve experienced it several times. Once the sale was made it seemed the company was more interested in additional sales than providing customer support. 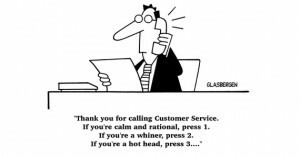 As an inside sales guy I make customer service a part of my responsibilities as I felt it was a necessary part. Since being laid off, many months ago, I attempted to go to the service side and out of the sales side but with each customer service resume I submitted the people who interviewed said I had more sales than CS experience. To make a long story short, I asked if they didn’t consider CS as important as the sales and, basically, they said not really. I disagree but, then again, I wasn’t doing the hiring. I agree completely, we’ve seen both sides of this premise play out countless times over the years. Remember back in the day when CD-R drives cost $300 and took 35 minutes to make a copy? At that time HP had written the book on top-notch, user-centric after-sale support, they were awesome, and it bought them extreme loyalty, [almost] no matter how much less-than-competitive their price points became. Jump ahead a decade or so, I had such a horrific and lengthy experience trying to get support for an aging printer, that my top criteria as I shopped for a new one was “NOT HP”! Not only have I been happily using Brother printers ever since, but as a consultant I’ve influenced dozens of printer purchase decisions. They may have improved in this area since that experience, but I wouldn’t know, a chance to redeem themselves will likely never come again. Like a few other things that can’t be easily or immediately quantified, the importance of excellent customer service should never be underestimated. 1. The most valuable sales resource for new prospects are references from existing customers (hopefully positive). 3. The lack of sales commissions for service contracts does not promote a positive and profitable customer relationship over the long term. Transition to subscription based sales is one way for customers to get this problem addressed. 4. Diagnostic aids and support tools need to be recognized as key product features that deliver customer value, not just a cost of business for the support desk. As well as untrained or under qualified support reps I’d add unempowered support reps. I worked a project where the reps were not only extremely bright, well qualified but also super friendly and helpful. The problem was that other parts of the organization didn’t think much of them, didn’t provide them with the tools they needed and made their jobs as difficult as possible. Of course the customers assumed the staff were incompetent. Customer satisfaction was terrible. It was a pretty easy fix but it took a long time to convince the senior management to make a simple decision to fix things.